This post was sponsored by So Delicious Dairy Free, all thoughts and opinions are entirely my own. GOOD NEWS! 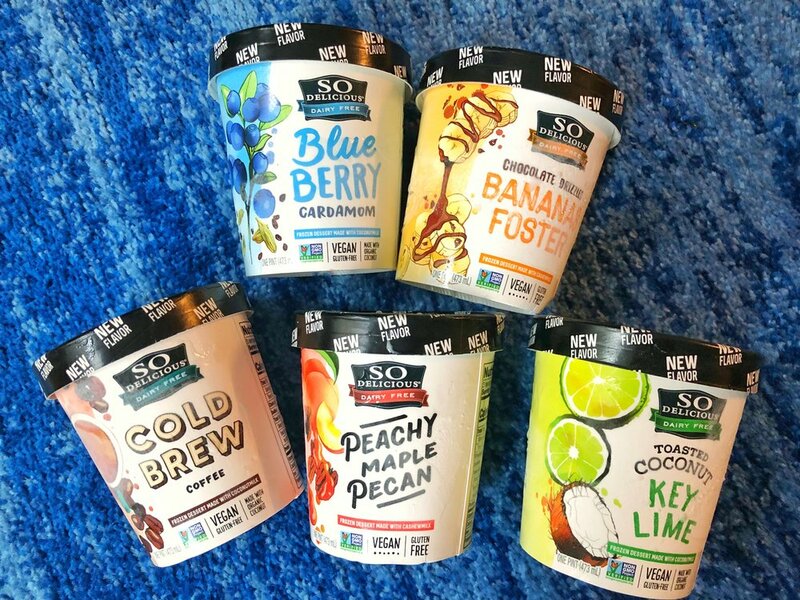 So Delicious added 5 new flavors to their dairy free frozen treats collection! It's always exciting when new flavors come out because that means more reason to buy tons of ice cream with the excuse of "taste testing." The new five flavors are: blueberry cardamom, chocolate drizzled bananas foster, peachy maple pecan, cold brew coffee, and toasted coconut. These new flavors (that comes in limited edition packaging with sassy taglines) have so much personality thanks to their unique ingredients. This was my favorite flavor out of the five because I just love these two ingredients individually that when they came together, my mouth found its happy place. I expected the cardamom to be too strong and spicy, but it balanced well. The ice cream also had the prettiest purple color, and when my food is pretty, I enjoy eating it more. When I posted about this flavor on my Instagram story, people flipped out. Some people said that they ate banana foster as a kid, which sounds like an amazing childhood. All I ate as a child was fruit, which my mom claimed was Earth's dessert. I love my fruit, but banana is a fruit too and when combined with vanilla ice cream and chocolate, it's definitely a kid's (and grown adult like myself) dream come true. The banana flavor isn't too strong and balances well with the vanilla with a hint of chocolate. It essentially tastes like chocolate dipped banana in an ice cream, so you can mentally trick your mind into thinking it's healthy...right? When I took a bite of this peachy maple pecan, my eyes widened. This ice cream tastes like roasted pecans covered in maple syrup drenched over a peach sorbet. The maple and pecan are two of the most prominent flavors, but as the ice cream melts on your tongue, the peach comes out. It's perfect for those who like the nutty flavors of the pecan, some summer fruit, and of course, a lot brunch vibes with the maple syrup flavors. I'm not a coffee drinker, so I was afraid this cold brew coffee was going to keep me up all night. This combined with my limited coffee exposure made me think that I wasn't the right customer for this new flavor. BUT good thing I got some taste testers to let me know if this ice cream tastes like the real deal. My boyfriend said this cold brew coffee ice cream had the same flavor as his artisan drink, so I think we have a winner. I think putting a scoop of cold brew coffee with actual cold brew could be an amazing combination, but I'm so sensitive to caffeine, so maybe I'm just making excuses to try to disguise this into something I could drink (someone try this and let me know if it's awesome). Coconut is a very popular vegan flavor. Big generalization I know, but it seems that there's coconut in every vegan item. There's coconut oil, coconut yogurt, coconut cream, coconut water, coconut chips, and even coconut bowls. I personally love coconut, so I have no complaints here, but my taste buds have now been trained to identify the most subtle of coconut flavors. This toasted coconut ice cream flavor is nice because it's doesn't have a strong raw coconut meat flavor, and it isn't too sweet. It's a good flavor for those who don't want something too intense but just get those hints of the tropical fruit. Whenever I hear key lime, I think of some nice grandmother in Florida who makes the best key lime pie. I'll be honest with all of you, I've never had a key lime pie. Usually key lime pies aren't vegan, and I never had one as a kid, so I just missed my window of opportunity. I'm sure I'll get to try a key lime pie in the future, but for now, thank you So Delicious for exposing me to this delicious fruit that is key lime. This ice cream was mostly sweet with a hint of lime (is key lime different from regular lime? If so, this just tasted like lime to me) which I actually enjoyed. The creaminess of the ice cream also made any bitterness of the lime pretty absent, which makes a sweet treat with just a little tang. 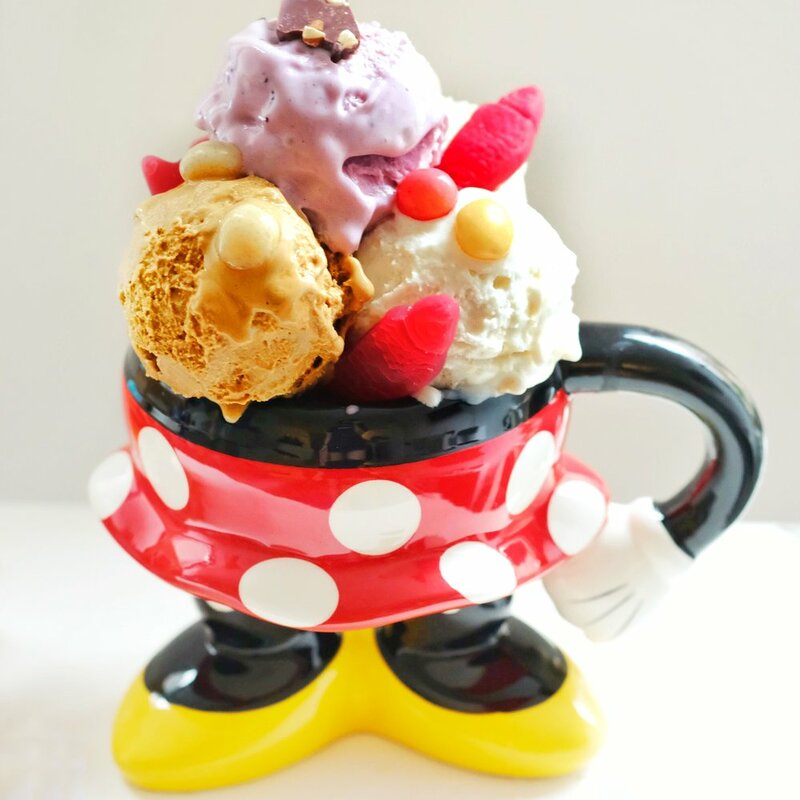 All the ice cream hanging out in my Minnie cup! Side note: I brought these pints of ice cream to work because it was my coworker's birthday and the whole team indulged in some So Delicious frozen treats. They've never tried So Delicious before, but they were "surprised" when the vegan ice cream "actually" tasted creamy and flavorful. I think it's funny when the reaction to eating good vegan food for omnivores to be "actually not bad." I'm glad So Delicious' new flavors got the omnivore stamp of approval.